Why Drowsy Driving Continues to Cause Truck Accidents | DeLoach, Hofstra & Cavonis, P.A. Anyone who has taken a road trip knows that long hours behind the wheel can cause a driver to suffer from drowsiness. Passenger car motorists have the option of pulling over for a nap or switching drivers to stay alert, but most truckers don't have this luxury. Since they're paid to spend as many hours behind the wheel as possible, it’s no surprise that drowsy driving is a common cause of truck accidents nationwide. While people understand that driving while tired is dangerous, many don't realize just how much it affects their ability to operate a vehicle. One study found that being awake for 17 hours produced similar impairment levels as having a blood alcohol concentration of .05. Remember, .08 is considered legally drunk. Sleep deprivation. The fewer hours people sleep, the greater the risk they'll be involved in a crash. A driver running on less than 8 hours of sleep increases their risk of having an accident by four or five times. Shift work. People who work and drive during the night are more likely to experience drowsiness than those who work a regular daytime schedule. Truckers who drive at night suffer the dual risk of peak crash times, as well as fighting the body’s natural biological rhythm to sleep after dark. Highway travel. “Highway hypnosis” is a real phenomenon, with more people reporting nodding off or veering off the road due to drowsiness on high-speed expressways than on city streets. Sleep disorders. 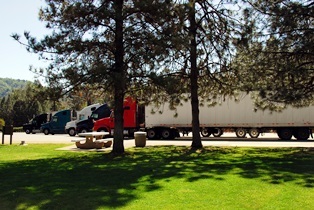 Many commercial drivers suffer from sleep disorders such as insomnia and sleep apnea. The Federal Motor Carrier Safety Administration (FMCSA) estimates that as many as one in every four truck drivers have sleep apnea, a condition that prevents a person from getting full and deep sleep. Although sleep apnea can disqualify a trucker for commercial driving under federal regulations, many cases are undiagnosed. Drowsy behaviors. Falling asleep at the wheel isn’t the only way truckers contribute to an accident. Those who are fighting fatigue often report feeling stressed, prompting them to drive faster or more erratically. Sleep deprivation acts like alcohol in the system, affecting coordination, concentration, reaction times, visual acuity, and judgment. Pressure from employers. Commercial truck operators have an obvious incentive to keep driving even if they feel tired. Employers may offer bonuses for faster deliveries, or even threaten to fire drivers who favor mandatory rest periods over deadlines. The most common method for determining if a fatigued trucker disregarded these regulations, is to check the driver logs to make sure all rest breaks were taken and recorded. Unfortunately, some operators are pressured to alter their schedules to hide any evidence indicating they were driving longer than the legal limit. It's vital that your attorney request copies of all documents, such as fuel receipts, hotel or motel records, videos and data from on-board recording devices, cellphone records, dispatcher communication, and GPS monitoring, in order to determine whether a trucker was breaking the law. It may be difficult to prove that a big rig operator fell asleep at the wheel, but the right evidence can identify the likely cause of the crash, as well as hold the trucking company and operator accountable for their mistakes. If you were injured in a truck crash, we can determine who's at fault and help you receive compensation for your medical bills, lost wages, and pain and suffering—and we don't collect any fees until your case is won. Simply fill out the quick contact form on this page to set up your consultation.